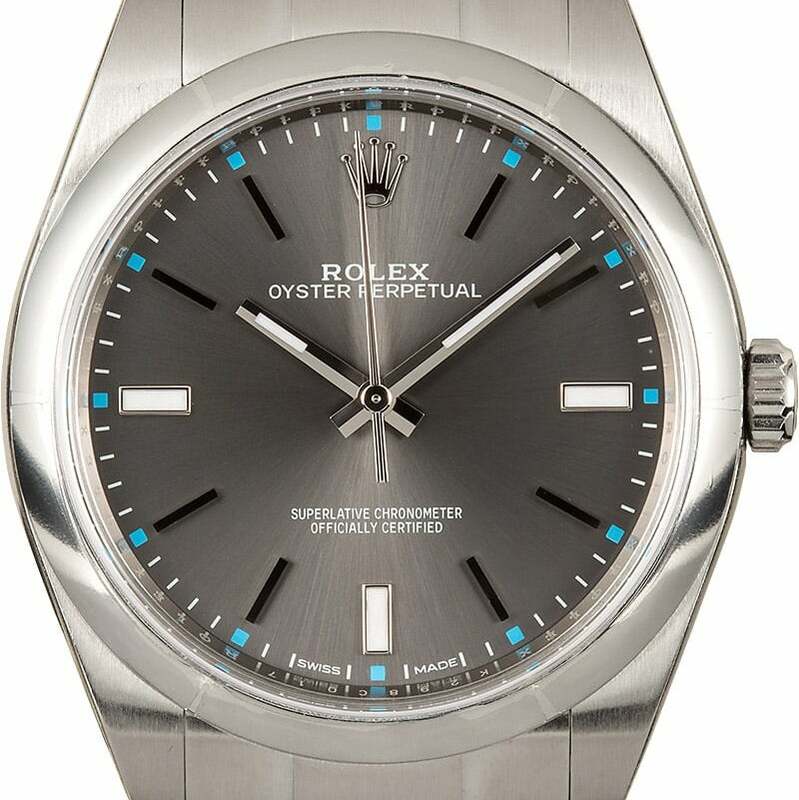 Rolex Oyster Perpetual ref. 114300 39mm with dark rhodium dial. 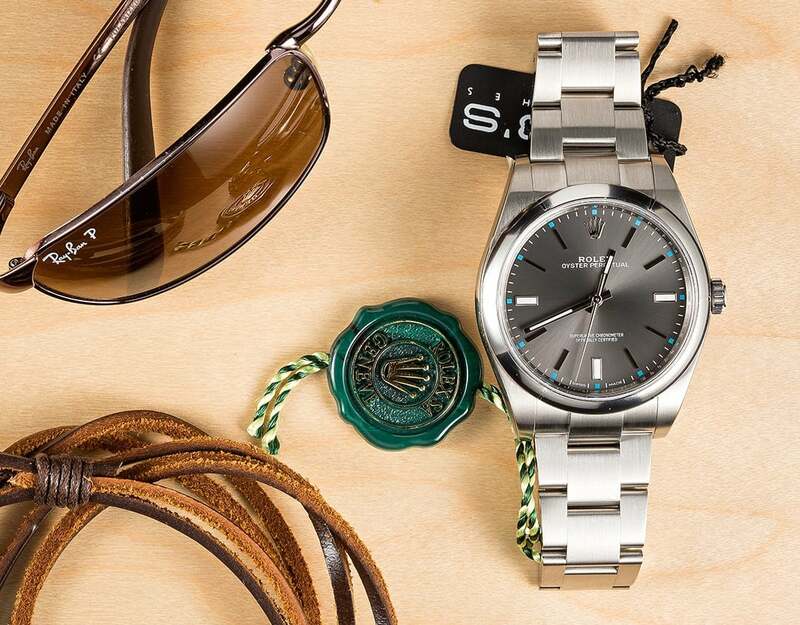 An entry-level luxury watch, the Rolex Oyster Perpetual 114300 offers fantastic value and versatility. It may be a straightforward, time-only watch, yet it’s versatile in that it can be worn anytime, anywhere, without ever being out of place. The Oyster Perpetual sits comfortably at the midway point of a sports watch and a dress watch. In 2015, Rolex unveiled the 39mm version (ref. 114300) of the Rolex Oyster Perpetual, which is an ideal size for both men and women to wear. 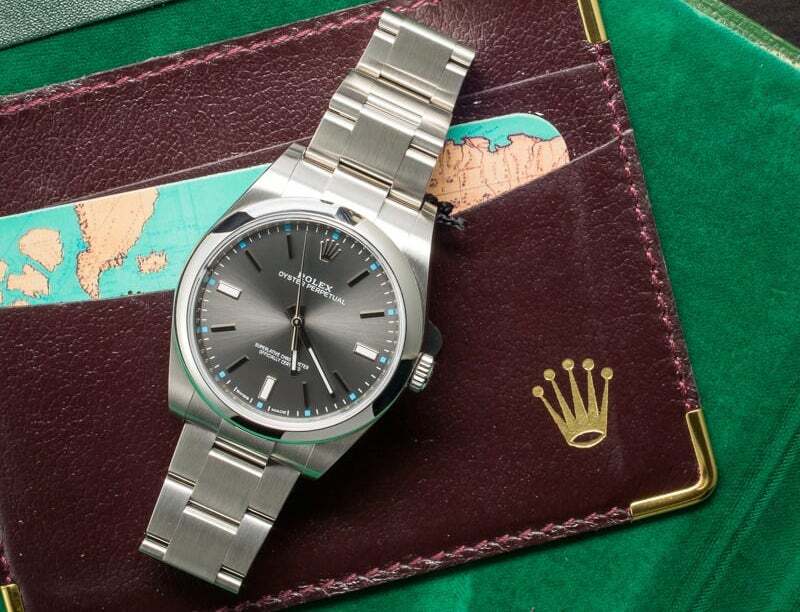 The new watches bear the characteristic hallmarks of Rolex such as the stainless steel Oyster case, the stainless steel Oyster bracelet, water resistance to 330 feet (100 meters), and a COSC-certified automatic movement. Yet, the newest iterations of the Oyster Perpetual timepieces are markedly fresher and more youthful than their predecessors thanks to their dials. 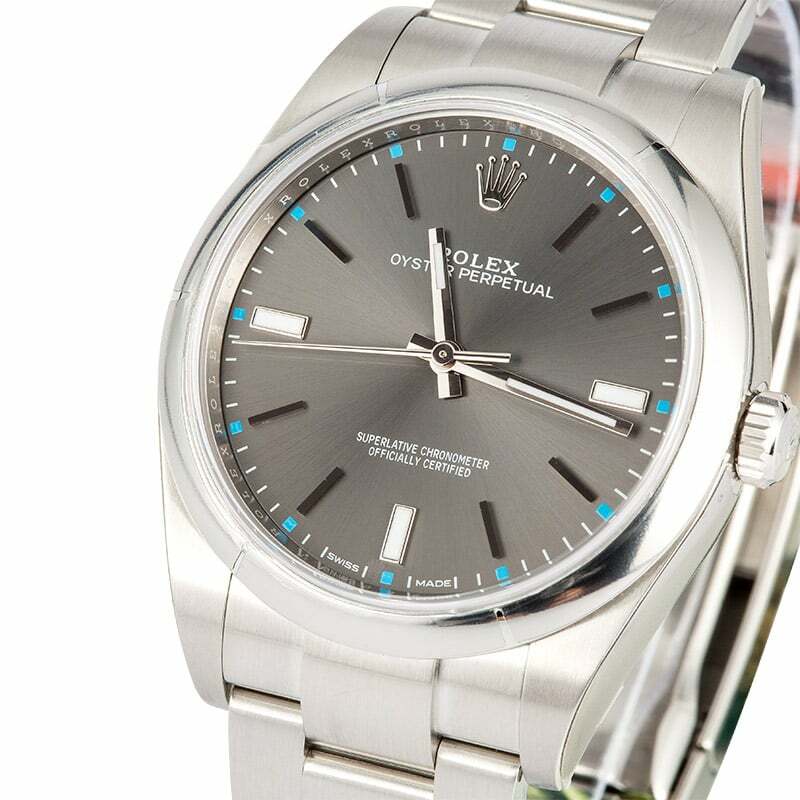 Rolex Oyster Perpetual 39mm with a dark rhodium dial. 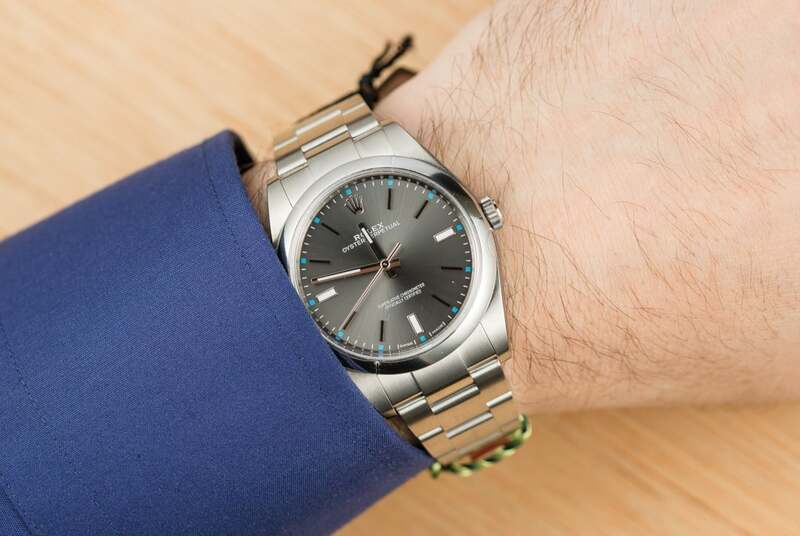 Although simple in function, the Rolex Oyster Perpetual is brimming with style. The three new dials of the 39mm Oyster Perpetual timepieces are sun-brushed for a vibrant effect and are available in dark rhodium, red grape, and blue. The dials boast a further splash of color with 12 hour-marker accents in a contrasting color — light blue on the rhodium, cherry red on the red grape, and lime green on the blue. The perfectly symmetrical look on the face of the watch is sophisticated and the scratchproof sapphire crystal is uninterrupted due to the lack of a date window and Cyclops lens. The smooth bezel finishes off the sleek style while the luminous accents provide just the right amount of visibility in the dark. While positioned as an entry-level Rolex, the luxury watchmaker has certainly not forgone the fine details of the Oyster Perpetual. Within the Oyster case is the ultra-dependable Rolex Caliber 3132 automatic mechanical movement with 48 hours of power reserve, the antimagnetic blue Parachrom hairspring, and the Paraflex shock absorbers for added resilience. As with all modern-day Rolex watches, the Oyster Perpetual 114300 is a Superlative Chronometer Officially Certified offering a precision of +2/-2 seconds per day — double the requirements set out by COSC. 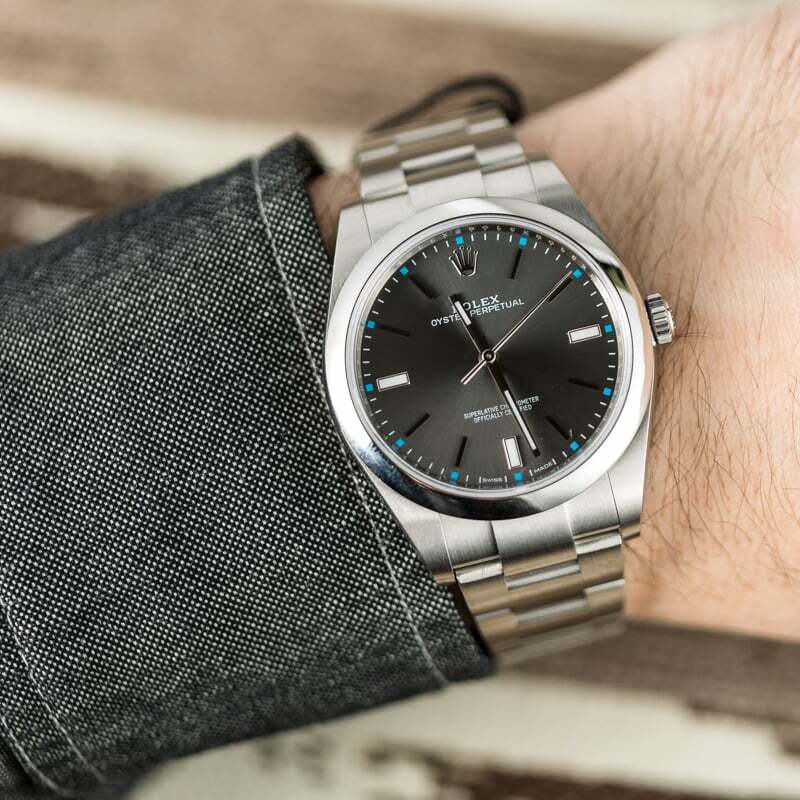 The Oyster Perpetual 39mm joins a collection of other sizes and dial colors — 26mm, 31mm, 34m, and 36mm — further boosting the already solid variety of options within the stainless-steel time-only Rolex series. Whether it’s your first Rolex watch or another addition to your Rolex collection, the Oyster Perpetual ref. 114300 is a solid and accessible option that will look just as great in the next few decades as it does today. And if you’re looking to sell a Rolex like this one down the road it will undoubtedly hold it’s value.